In the early 1930s, Henghes was described as the ‘new Gaudier’. He had left his birthplace of Hamburg as a teenage stowaway on a ship to America, where in 1930s New York he became part of a circle of artists and poets including Max Ernst, Man Ray, and the sculptor Isamu Noguchi. He exhibited there before returning to Europe where he briefly assisted Brancusi in Paris and worked in Italy with the patronage of Ezra Pound. In Paris, Henghes mixed with writers and artists like Henry Miller, Jean Genet, and Anaïs Nin. 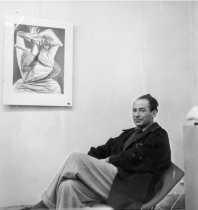 He left for England in 1937 and took a studio in London, met Barbara Hepworth, Ben Nicholson, Naum Gabo, and Herbert Read, and exhibited in Peggy Guggenheim’s gallery in Cork Street. After the war, Henghes taught at the Royal College of Art and made the large marble Madonna and Child included in this exhibition. 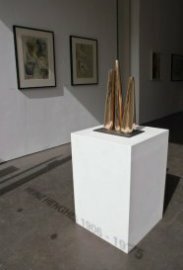 In the 1950s he exhibited in the open air exhibitions of leading sculptors and in the Festival of Britain, and lived in the Dordogne before taking up the post of Head of Fine Art at Winchester School of Art. Heinz Henghes’s work is represented in several permanent collections including the Museum of Modern Art in New York, and his archive was recently acquired by the Henry Moore Institute. The Department of Prints and Drawings at the British Museum has acquired several works from this exhibition.